Learn to Lead the Next Generation of First Responders. Lewis University's online Master's in Public Safety Administration is a 36-hour program that provides students with a contemporary course of study that is practical and flexible to meet the needs of public safety professionals. The online program teaches to efficiently manage resources and lead teams in this evolving field, while directing first responders. Through this masters in public safety students will also learn to reduce the threat of potential hazards at the local, state and federal levels through applied theories and practices surrounding both risk management and crisis intervention. Lewis University's online Master of Science in Public Safety Administration teaches the vital skills to navigate and address the complex challenges of public safety while confidently leading and communicating with authorities in times of crisis. Students will also develop a comprehensive understanding of the fundamentals involved in emergency management and response, public safety, environmental protection and more. Public Safety Administration and Management – This course provides a study of public safety management theories, methodologies and practices, as well as an examination of the responsibilities of public safety managers. Public Safety Law and Civil Liability – This course provides an in-depth examination of the relationship between law and public safety, as well as a study of the liability of public safety personnel. Public Safety Administration Incident Command – This course examines the roles and responsibilities of fire, police and EMS, how different public safety departments work together in response to emergency scenarios and how public safety directors coordinate complex response efforts. Critically analyze issues associated with decision making, communication and conflict resolution that impact organizational behavior. Demonstrate knowledge of leadership theories, concepts, and practices as related to the effective management of organizations. Discern principles and theories of motivation that relate to employee performance and behavior within organizations. Formulate creative responses to complex issues through critical analysis. Model ethical and professional behaviors to guide inquiry and practice in a global and diverse society. Synthesize theoretical and research concepts from multiple perspectives to inform inquiry and practice. Systematically examine principles and values of managing diversity within organizations. 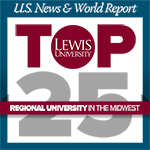 L ewis is a nationally recognized university by U.S. News & World Report, The Princeton Review, Colleges of Distinction, College Access & Opportunity and GI Jobs. Join the legacy of Lewis' public safety alumni community. Receive a first-class, real-world education from experienced and connected practitioner faculty actively serving on the front lines of public safety leadership. Our faculty is strengthening leadership in the public sector by helping to shape the next generation of public safety executives. Enroll in an online public safety administration degree program taught by leaders in the field who bring decades of combined professional experience in such areas as correctional facility management, law enforcement administration, and public safety human resources development. Lewis University's online Master's in Public Safety Administration is designed to help those who are preparing to manage police, fire, emergency medical services, law enforcement services and other public safety occupations in our society. The online program is ideal for students interested in challenging yet rewarding leadership career opportunities in the public safety field, such as chief security officer, emergency management coordinator, homeland security officer, loss prevention manager and natural disaster response administrator. This master’s degree program can prepare you for any number of high-paying public safety administration jobs, and the convenience and flexibility of the program’s online distance learning format means you can develop the skills needed for leadership in the public sector without sacrificing your current work or family duties. Become a leader in public safety with Lewis University's Public Safety Administration Master’s program, available online and on-campus. Call (866) 967-7046 to speak with a Graduate Admissions Counselor or request more information.